Two people, two phones. Hubby and I were both calling the reservation line of The Fat Duck and that's how I got a reservation for the Fat Duck's last service of 2011 on Sunday December the 18th. Yes, even after all those years people still frantically call the Fat Duck on the day when reservation lines open for bookings two months in advance. I really wanted to book a table as it had been six years since my last visit. Self-taught chef Heston Blumenthal's legendary restaurant is located in Britain's top culinary destination Bray-on-Thames. 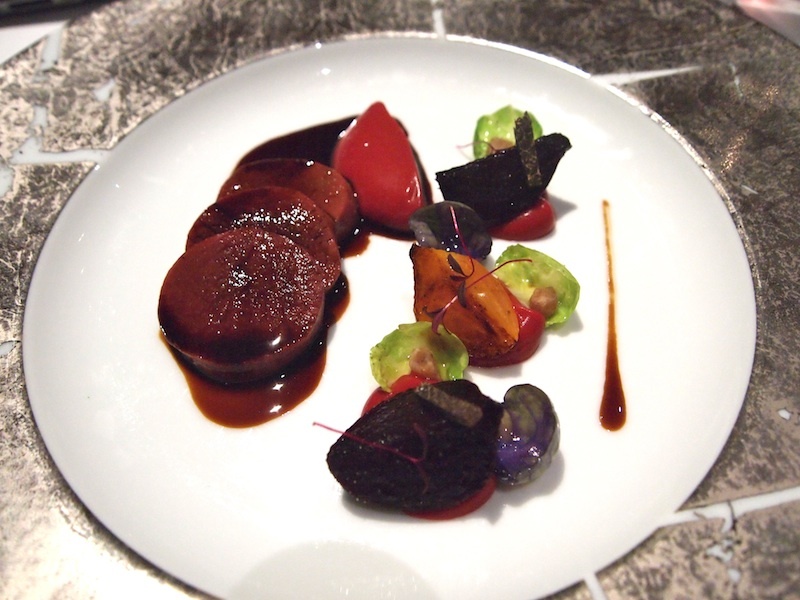 The Fat Duck was awarded its first Michelin in 1998, followed by a second star in 2001 and finally a third star in 2004. A year later The Fat Duck took the number one spot on The World's 50 Best Restaurants list and was the second best restaurant in the world from 2006 till 2009. The restaurant currently takes the number 5 position in the World's 50 list. Blumenthal and his restaurant have won numerous other awards which they proudly list on their website. 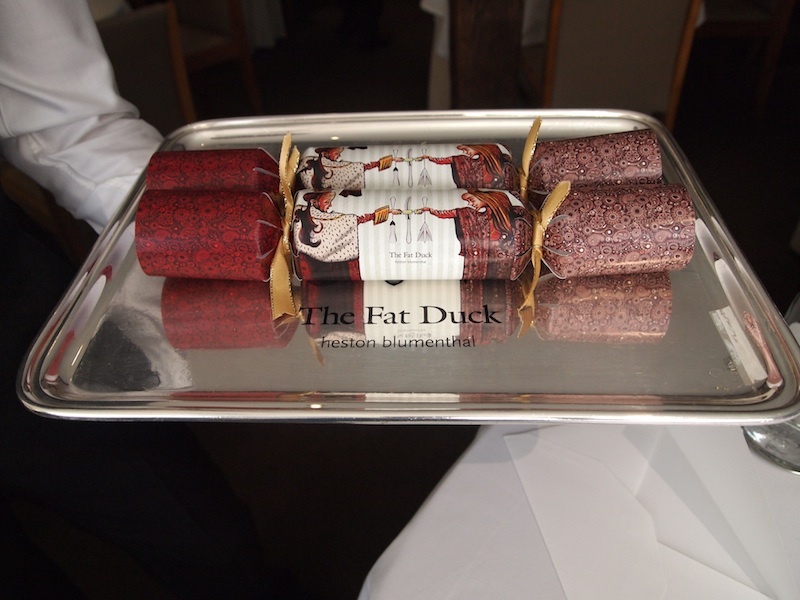 The Fat Duck is open for lunch Monday till Saturday and for dinner Tuesday till Saturday. 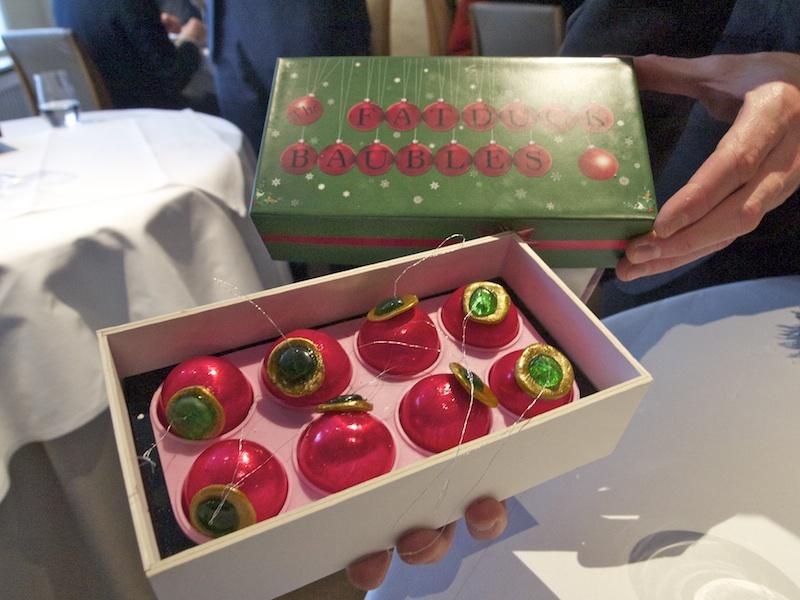 At lunch and dinner the Fat Duck serves a 14-course tasting menu (£180) only. So, here we go. We started off with an aerated beetroot and horseradish 'macaron', a beautifully made macaron-shaped pre-starter; sweet, earthy, sharp with fantastic texture and length. Next were the Nitro Poached aperitifs (first course). We had the choice between Vodka and Lime Sour, Gin and Tonic, Campari Soda and blood orange. I had the Vodka and lime sour, hubby had the Campari Soda and blood orange. The meringue like mixture is poached in liquid nitrogen. The vodka and lime sour one was dusted with green tea dust and the campari soda rendition with blood orange dust. To intensify the experience a citrus perfume was sprayed just before the aperitifs were served. Excellent palate cleansers, sweet, citrussy and refreshing. Second course, Red cabbage gazpacho, Pommery grain mustard ice cream. Beautiful clean and pure cabbage flavours. The mustard ice cream was delicious and it had the perfect touch of sharpness. Lovely acidity too. I forgot to take a photograph of this dish. Third course, Jelly of quail, crayfish cream, chicken liver parfait, pea puree, oak moss and truffle toast. An exceptional dish that challenged all the senses. First the oak moss. The oak moss comes in two ways, in a 'smoking' wooden box and in a thin film strip designed to melt on your tongue. 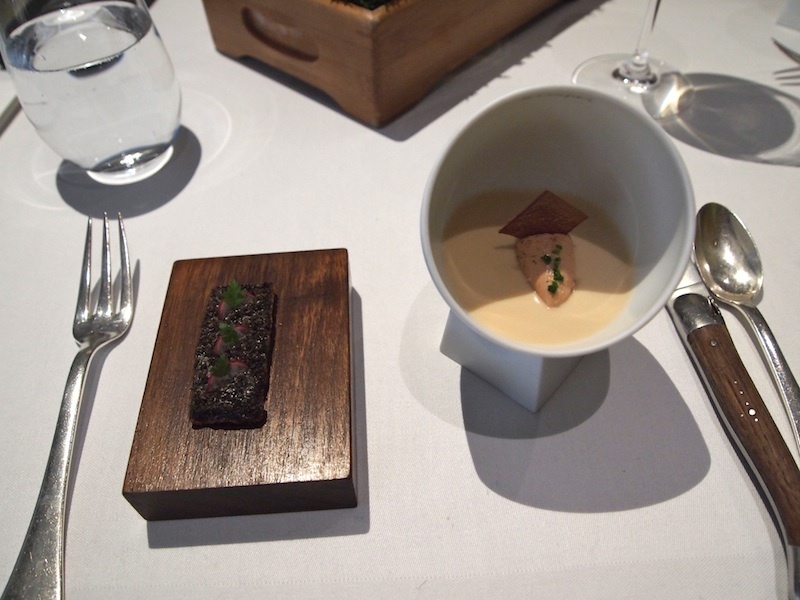 The quail jelly, crayfish cream, chicken liver parfait and pea puree were served layered in a ceramic bowl. Gorgeous, each made to perfection and every single layer had a perfect consistency and divine, intense flavours. Although the layers in the dish are designed to be eaten together with every spoonful, I just had to try them separately too. The jelly had wonderful concentrated quail flavours and a lovely light consistency. The crayfish cream was light and creamy and the pea puree was sublime. And when eaten together they delivered a fantastic taste sensation. The terrific thin and crisp truffled toast was gorgeous and had the perfect amount of truffle on it. A flawless dish with very well-balanced earthy flavours and a feast for all the senses in every respect. Fourth course, Snail porridge, Iberico Bellota ham, shaved fennel. 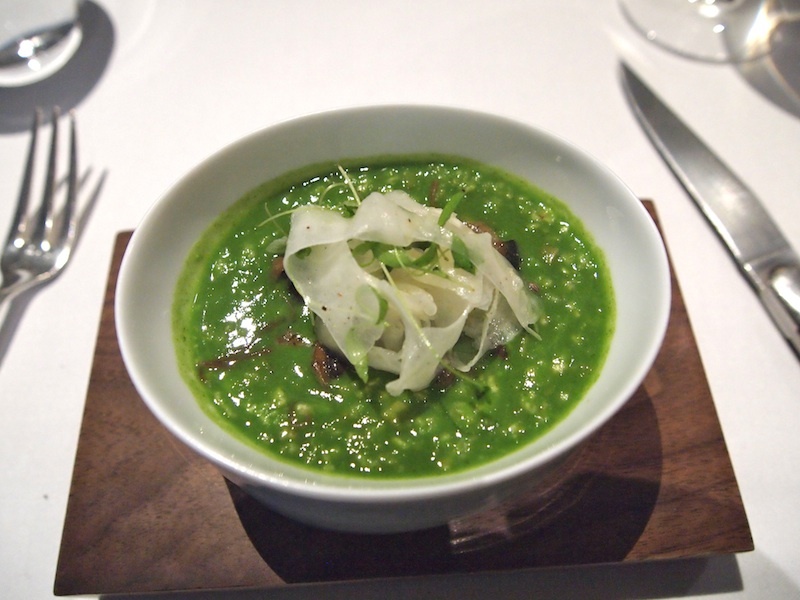 A wonderfully sumptuous and relaxing dish (the senses could do with a bit of relaxation at this stage) with an amazingly bright green colour. Perfectly cooked snails, beautiful richness from the parsley and garlic butter, lovely saltiness and texture from the ham. Fantastic flavour and texture from the shaved fennel too. Very elegant and very well conceived comfort food. Even though this dish wasn't presented in layers it certainly delivered a wonderfully layered flavour experience on the palate. 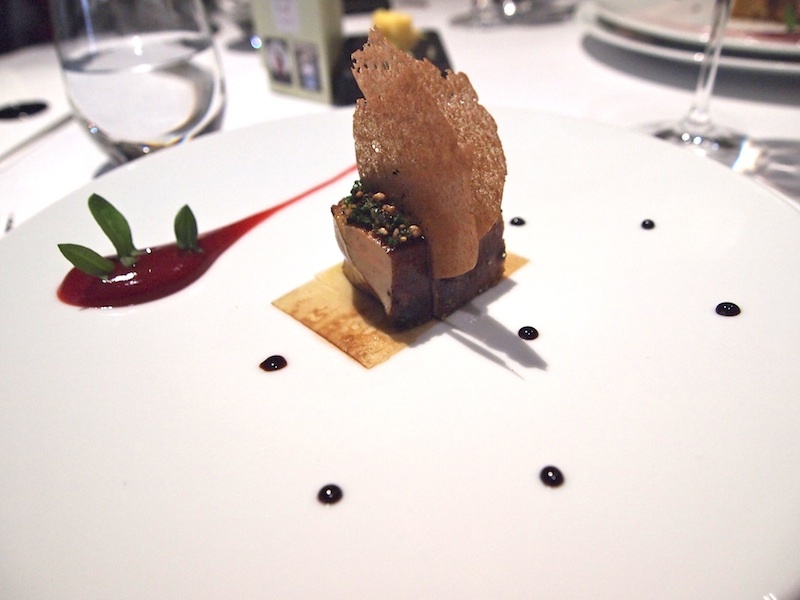 Fifth course, Roast foie gras, barberry, braised konbu and crab biscuit. An awesome, perfectly cooked piece of foie gras with chopped chives on top, true perfection. Lovely sweet and sharp flavours from the barberry puree - the barberry adds just the perfect touch of tartness. Lovely Asian touch from the konbu. Amazingly powerful crab and balsamic dots on the plate and beautiful, intense crab flavours from the crab crisps. A well-balanced dish with wonderful and exciting flavours and textures. 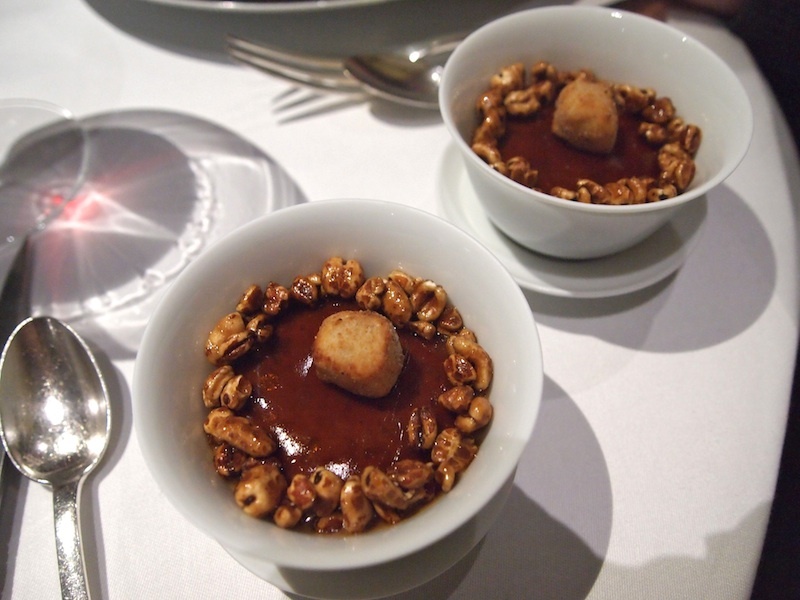 Sixth course, Mock Turtle Soup (c. 1850) and Mad Hatter tea. 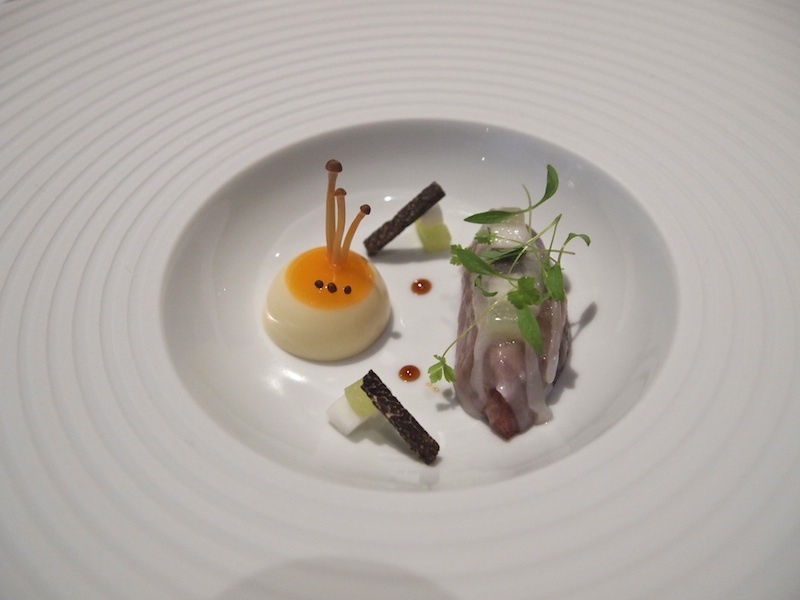 A wonderfully creative and beautifully presented dish. 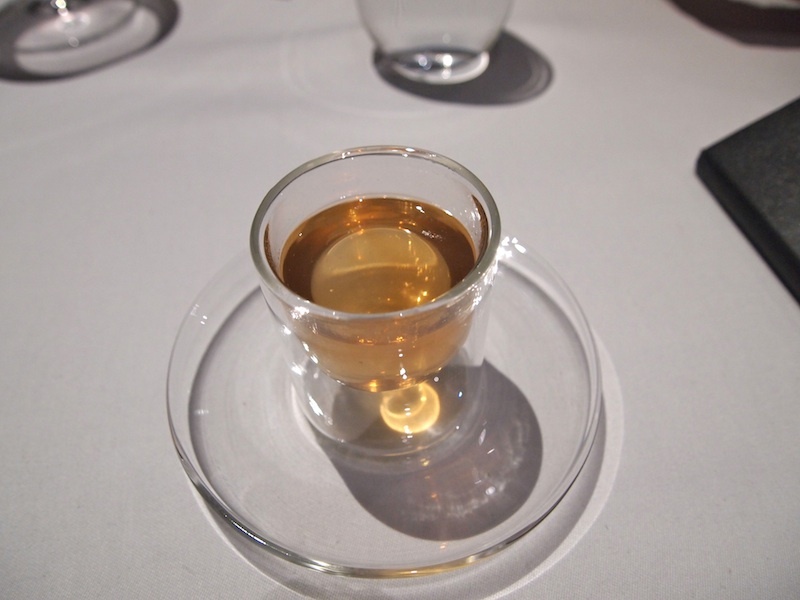 First you make the "Mad Hatter Tea" by pouring hot water over concentrated consommé and gold leaf. As soon as all the ingredients are mixed together you pour the tea over the dry ingredients, which are pressed veal, pickled cucumber, mushrooms, truffle and one other ingredient I can't remember, and there you have it, Mock Turtle Soup. Perfect, clear and delicious, pure broth with a sensational depth of flavour. Lovely touch of acidity from the pickled cucumber. Wonderfully rich pressed veal. A very comforting dish - in fact I wrote down in my notebook: feeling toasty. Seventh course, Sound of the Sea. Does sound influence the perception of flavour? 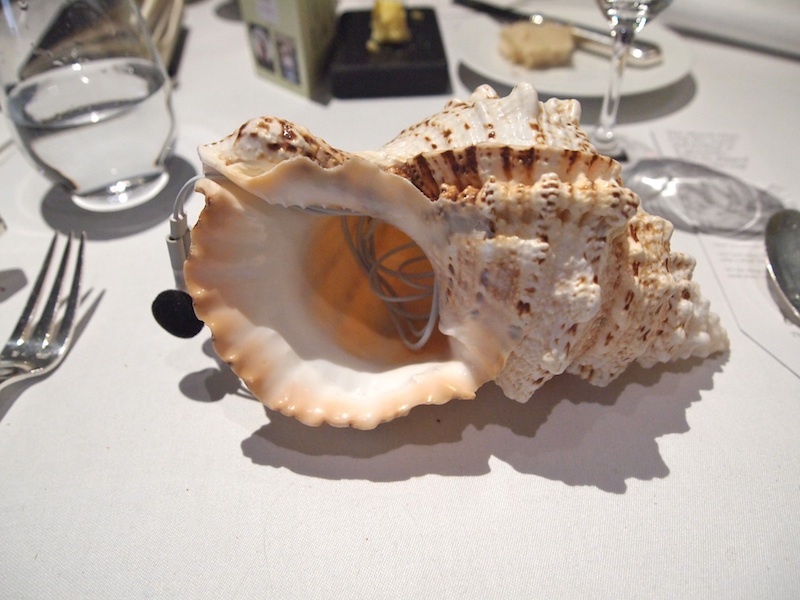 "Sound of the Sea is served accompanied by a conch shell containing a postage stamp-sized piece of electronica, and we've developed an soundscape (of a seascape) for it using binaural recording, which takes into account the 360-degree nature of the way we actually listen to things." (The Big Fat Duck Cookery Book). Right, that's the sound part and then there's the food part, this is served on a glass plate and underneath the glass there is a bed of sand. 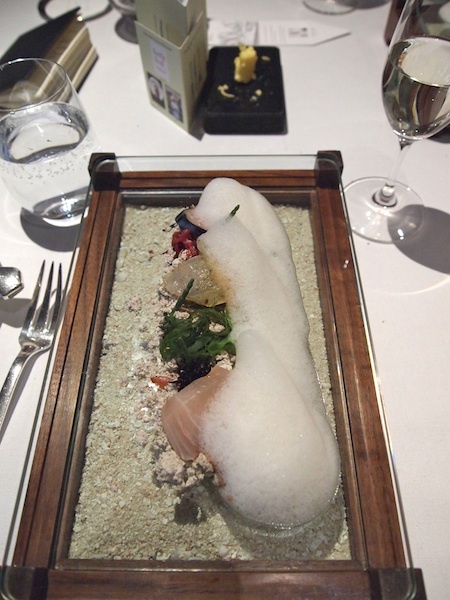 On the glass plate are mushroom, mackerel, halibut, kingfish, Japanese (pickled) seaweeds, tapioca sand and sea foam. An exciting and entertaining dish and what a great way to trick the brain. Without the sea sounds this dish had lovely flavours and textures but they were clearly intensified as soon as you put the earphones in and heard the typical seashore sounds. Eight course, Salmon poached in a liquorice gel, artichokes, vanilla mayonaise, grapefruit and golden trout roe served with fantastic Dauro olive oil (80% Arbequina, 10% Hoijblanca, 10% Koroneiki). 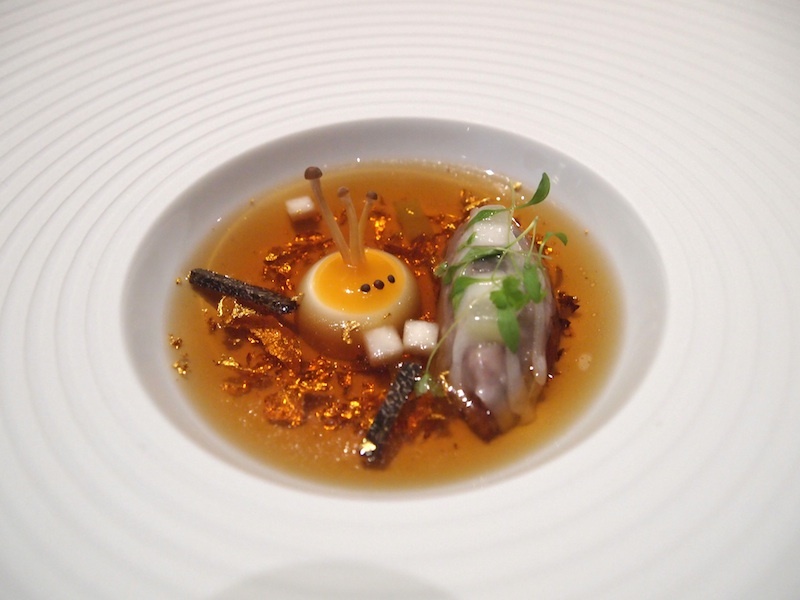 Together with the snail porridge, one of the the Fat Duck's most legendary dishes. Beautiful, flaky salmon with a terrific, thin layer of gel, which provided just the right touch of liquorice. Lovely acidity and bitters from the grapefruit vesicles underneath the salmon, wonderful warmth and sweetness from the vanilla mayonaise and superb artichokes. An exceptional dish with an amazing, virtuoso interplay of the five basic flavours. Ninth course, Saddle of venison, beetroot, risotto of spelt and umbles (offal). Divine, moist and succulent, almost 'Sauerbraten' like venison. Delicious venison jus which had been reduced very well and had an amazing depth of flavour and wonderful hint of mixed spice. Lovely beetroot and Brussels sprouts leaves too. The risotto was served in a separate bowl and was absolutely stunning, rich, sticky, sweet, fantastic crunch from the puffed spelt, perfection. A flawless dish with sensational flavours and textures. Tenth course, Hot & Iced tea. A course that's easier to experience than to describe. Well, the description basically says it all. Hot and cold tea served in one glass. Nice and refreshing, lovely floral notes. Eleventh course, Taffety tart - caramalised apple, fennel, rose, candied lemon and black current sorbet. A beautifully presented dish. Delicious rose cream served between wafer-thin crisp layers of caramelised pastry. Amazingly concentrated black current sorbet. Lovely sharpness from the candied lemon. Wonderful candied rose petals too. An excellent dessert that was perfectly executed. 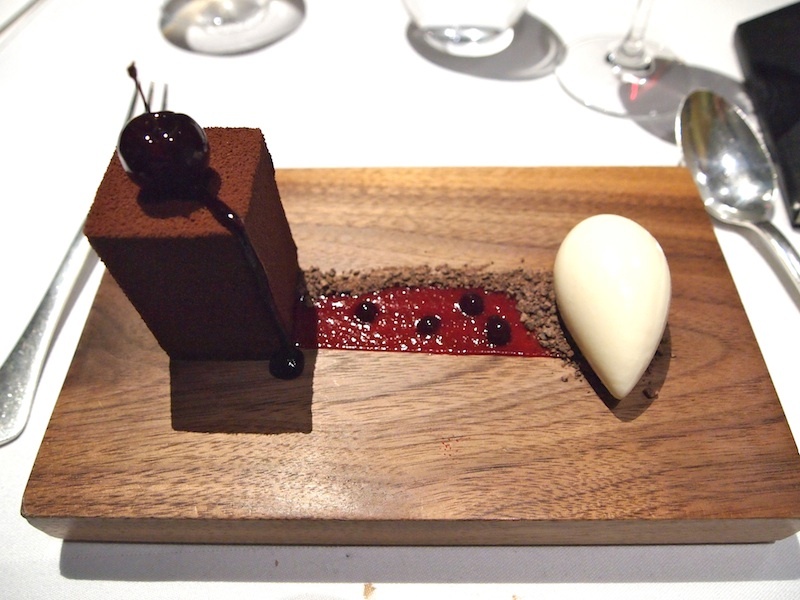 Twelfth course, The BFG, Black Forest Gateau. Heston's fascinating and intricate take on this British classic from the seventies. 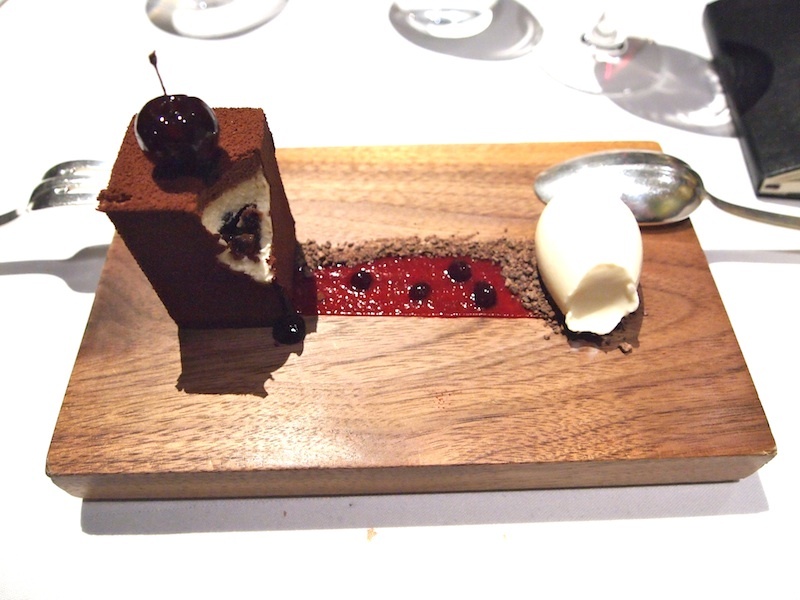 A perfectly made multi-layered Black Forest Gateau: a crisp almond base, aerated chocolate, white chocolate and Kirsch mousse, chocolate ganache, sour cherries, chocolate sponge, served with some cherry puree, chocolate crumbs, Kirsh ice cream and a spray of the Black Forest. A gorgeous indulgent and boozy chocolate dessert with fantastic (bitter) chocolate flavours. Terrific sharpness from the cherry puree. A beautiful and fragrant dessert. Fantastic textures too. Thirteenth course, Whisk(e)y gums. Bottle shaped whisky gums made with 5 different whisk(e)ys, Glenlivet, Oban, Highland Park, Laphroaig and Jack Daniels. 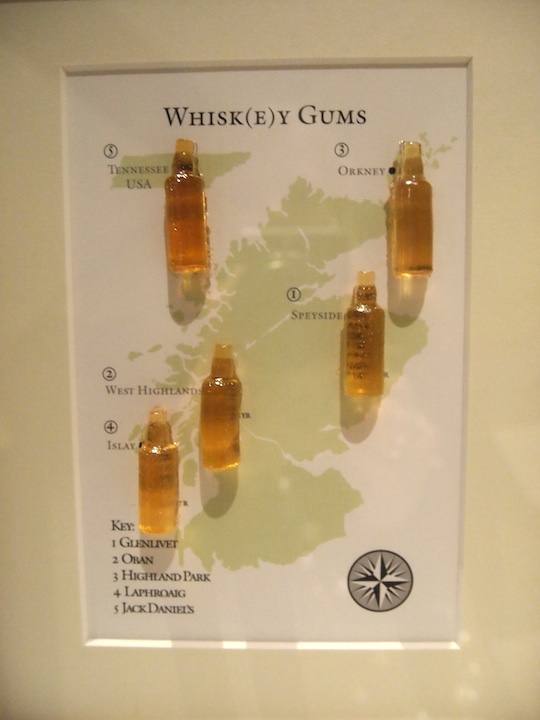 The whisky flavour of the gums was quite powerful, it was like having a sip of whisky. Fantastic presentation. Fourteenth course, Like a Kid in a Sweet Shop. A great selection of Fat Duck sweets. 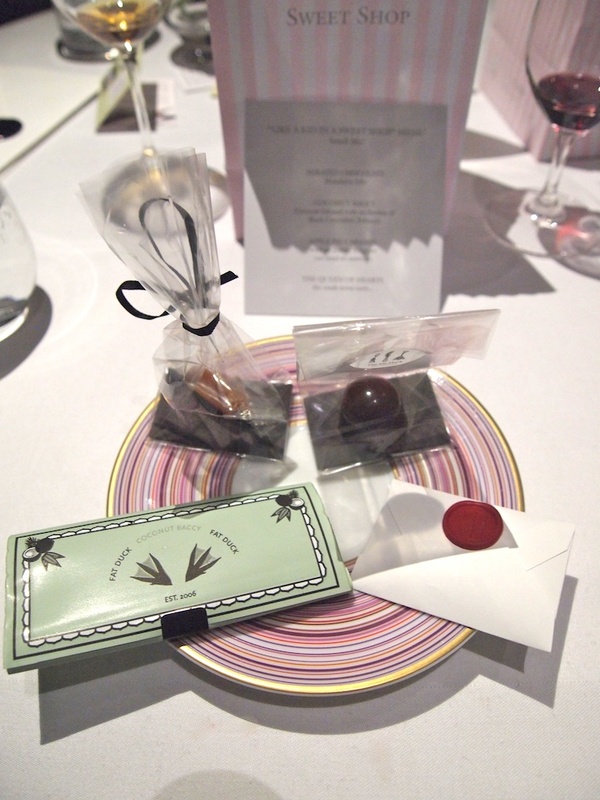 Aerated chocolate with mandarin jelly - Fat Duck coconut baccy (coconut infused with an aroma of Black Cavendish tobacco) - Apple pie caramel with an edible wrapper - Queen of Hearts (chocolate playing card). A fun and well-chosen end of an amazing meal. This meal was a parade of immaculate food, prepared and served with military precision. It needs no saying that Heston Blumenthal is very rarely to be found behind the stoves at the Fat Duck, however the experimental kitchen, the menu and the restaurant reverberate with the soul of this great chef. His representative on earth, his Benedictus XVI, is his Canadian head-chef Jonny Lake. 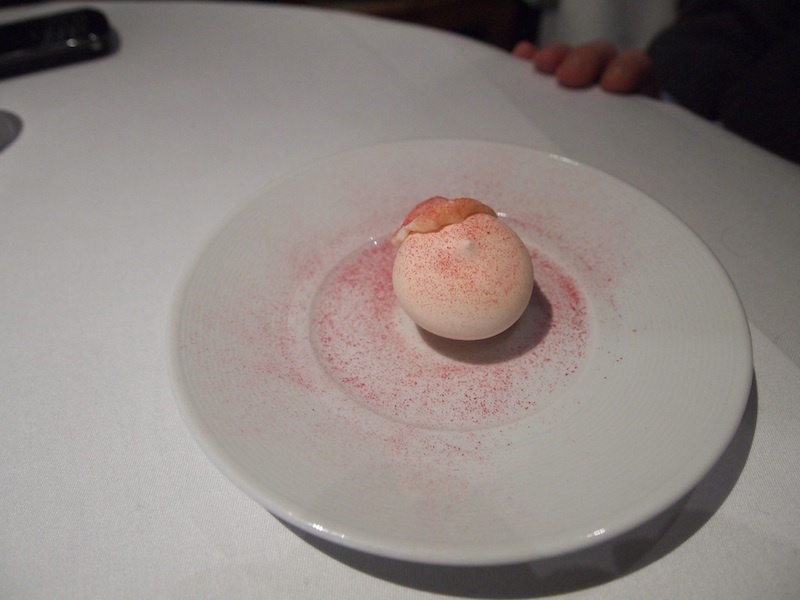 There have been those who have complained that the Fat Duck is not innovative anymore and has continued to serve the same dishes to its punters for a number of years now. This is clearly a misconception: one only has to compare to menu of 2005 with menu of 2011 to see that many changes have been made and Jonny Lake pointed out when I spoke to him after my lunch that the dishes that do re-appear are in constant development too. 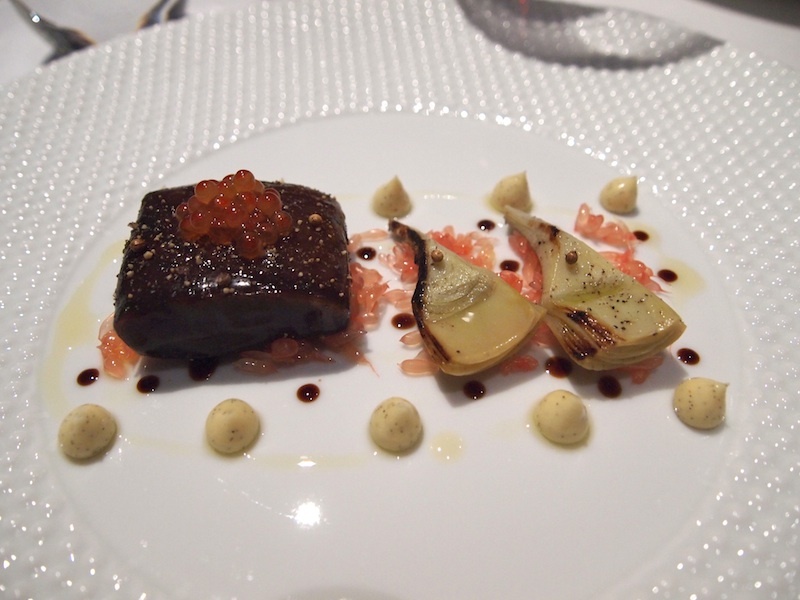 The salmon poached in liquorice gel anno 2011 bears very little resemblance to the version I enjoyed in 2005. Constant improvement is innovation too and not every (hysterical) innovation is an improvement. Jonny Lake was very clear: if he and his team would have to cook to same dishes year in and year out they wouldn't be at the Fat Duck. I guess not many people have The Fat Duck as their neighbourhood grill anyway. Those who only get to visit this restaurant at large intervals or maybe even only once in their lifetime, will no doubt be overjoyed to find some of the famous classics that have wowed many people before them on the menu. May a snail porridge of the people, by the people and for the people never perish from this earth (the Braysburg address). Service was conspicuously perfect, only in the UK and even there in very few instances have I encountered that magical mixture of military precision and seemingly relaxed effortlessness. Amazing attention to detail: Front of house spotted that there was a left handed diner at the table and placed the cutlery accordingly. 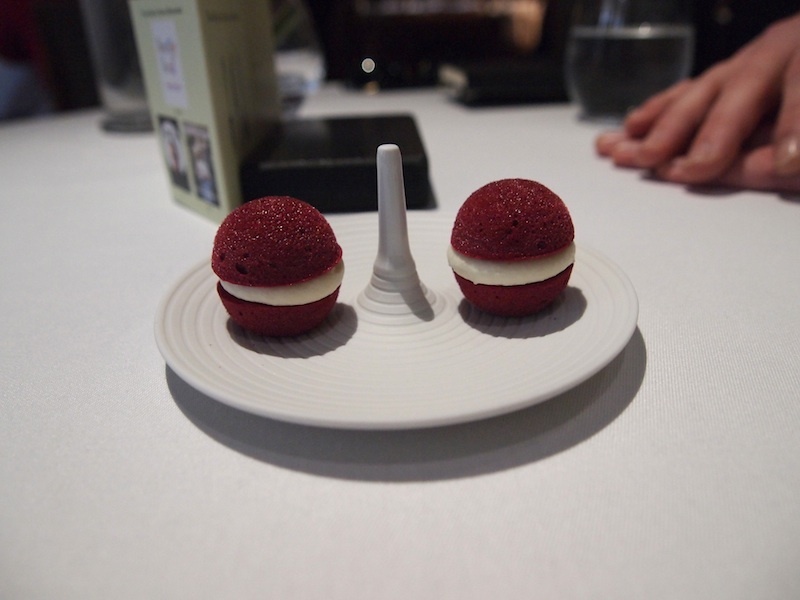 I've visited three-star restaurants in Europe and the US on more than 30 occasions but for me the Fat Duck is at the very top of the culinary pyramid - both food and service. 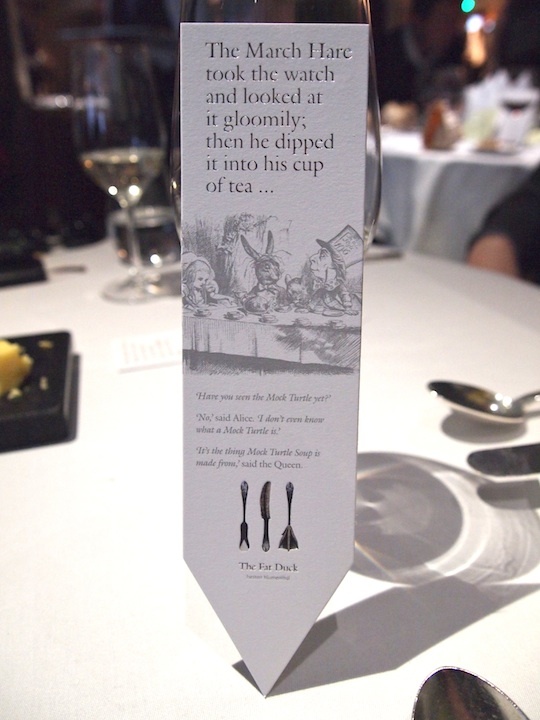 To put it more succinctly: I have never been to a better restaurant than the Fat Duck.